Before performing pre-disposal deployment of any SRS part, review and closely follow all applicable environmental and hazardous material regulations. Pre-disposal deployment may be considered hazardous material treatment. An airbag or pretensioner may be activated by static electricity. To prevent this, be sure to touch a metal surface with your bare hands to discharge static electricity before performing this procedure. Never dispose of a steering pad with an undeployed airbag. 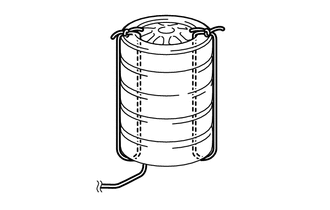 The airbag produces an exploding sound when it is deployed, so perform the operation outdoors and where it will not create a nuisance to nearby residents. 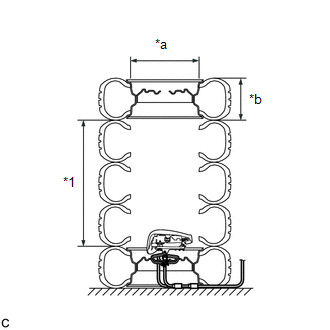 When deploying the airbag, perform the operation at least 10 m (32.8 ft.) away from the steering pad. The steering pad becomes extremely hot when the airbag is deployed, so do not touch it for at least 30 minutes after deployment. Use gloves and safety glasses when handling a steering pad with a deployed airbag. Do not apply water etc. to a steering pad with a deployed airbag. When scrapping a vehicle equipped with the SRS or disposing of the steering pad, be sure to deploy the airbag first in accordance with the procedure described below. If any abnormality occurs with the airbag deployment, contact the Service Dept. of TOYOTA MOTOR SALES, U.S.A., INC. When disposing of the steering pad, never use the customer's vehicle to deploy the airbag. Be sure to observe the following procedure when deploying the airbag. 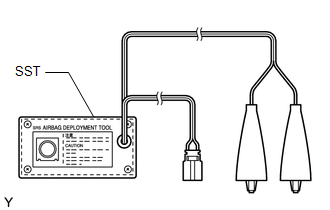 Prepare a battery as the power source to deploy the airbag. 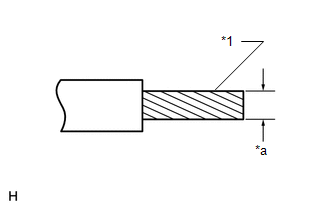 (a) Check the function of SST. 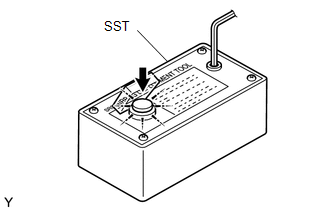 (1) Connect SST to the battery. Connect the red clip of SST to the positive (+) battery terminal and the black clip of SST to the negative (-) battery terminal. (2) Check the function of SST. Press the SST activation switch and check that the LED of the SST activation switch comes on. 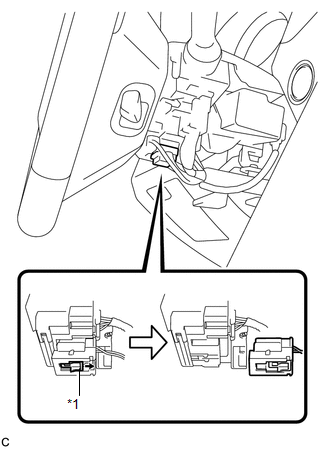 Do not connect the yellow SST connector to the airbag. If the LED comes on when the activation switch is not being pressed, SST is malfunctioning. Replace SST. (3) Disconnect SST from the battery. (b) Refer to Precaution (See page ). (d) Remove the lower steering column cover (See page ). (e) Disconnect the yellow airbag connector from the spiral cable with sensor sub-assembly. (1) Slide the slider to release the lock, and then disconnect the connector. Check that there is no looseness in the steering wheel assembly and steering pad. 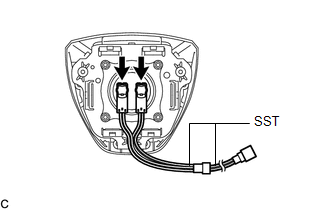 (1) Connect the SST connector to the airbag connector of the spiral cable with sensor sub-assembly. 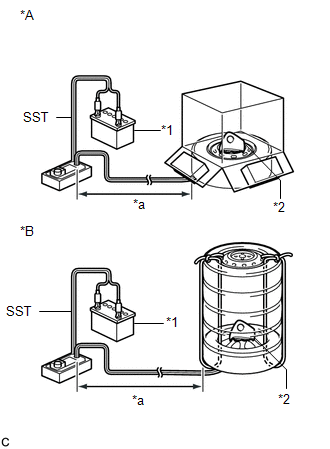 To avoid damaging the SST connector or wire harness, do not lock the secondary lock of the twin lock. (2) Move SST at least 10 m (32.8 ft.) away from the front side window of the vehicle. (3) Maintaining sufficient clearance for the SST wire harness in the front side window, close all doors and windows of the vehicle. Take care not to damage the SST wire harness. (4) Connect the red clip of SST to the positive (+) battery terminal and the black clip of SST to the negative (-) battery terminal. (1) Check that no one is inside the vehicle or within a 10 m (32.8 ft.) radius of the vehicle. 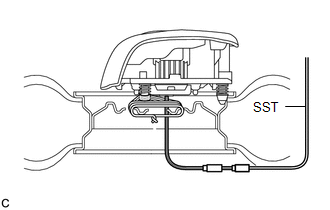 (2) Press the SST activation switch to deploy the airbag. Before deployment, make sure that no one is near the vehicle. The airbag is deployed as the LED of the SST activation switch comes on. (b) Remove the steering pad (See page ). Before removing the steering pad, wait at least 90 seconds after turning the ignition switch off and disconnecting the cable from the negative (-) battery terminal. When storing the steering pad, keep the airbag deployment side facing upward. (c) Using braided wire, tie down the steering pad to an unneeded wheel. If the wire harness is too thin or an alternative object is used to tie down the steering pad, it may snap when the airbag is deployed. Always use a wire for vehicle use with an area of at least 1.25 mm2 (0.0019 in.2). 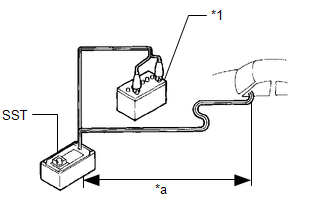 (1) After connecting the following SST to each other, connect them to the steering pad. (2) Wind 3 wires at least 2 times each around each of the snap pins. Tightly wind the wires around the snap pins without any slack. Make sure that the wires are tight. 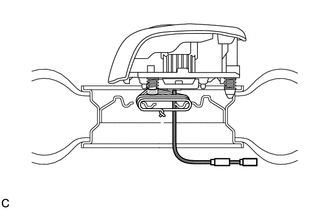 If there is slack in the wires, the steering pad may break loose when the airbag is deployed. (3) Face the airbag deployment side of the steering pad upward on top of an unneeded tire and wheel set. Separately tie the each sides of the steering pad to the wheel through the hub nut holes. Position the SST connector so that it hangs downward through the hub hole of the wheel. Always tie down the steering pad with the airbag deployment side facing upward. The wheel will be damaged by the airbag deployment, so use an unneeded wheel. Place the wheel on level ground. (1) Connect the SST connector. 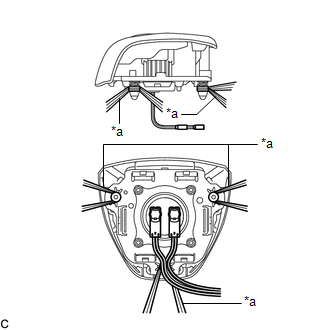 To avoid damaging the SST connector or wire harness, do not lock the secondary lock of the twin lock. Also, secure some slack for the SST wire harness inside the disc wheel. (2) Move SST at least 10 m (32.8 ft.) away from the airbag tied down to the wheel. (e) Cover the steering pad (using a cardboard box). (1) Cover the steering pad with a cardboard box. (2) Place weights on the cardboard box in 4 places totaling at least 190 N (19 kg, 42.7 lb). 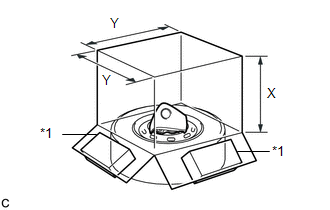 When dimension Y of the cardboard box exceeds the diameter of the wheel and tire to which the steering pad is tied, X should be the following size. If a cardboard box smaller than the specified size is used, it may be broken by the shock from the airbag deployment. (f) Cover the steering pad (using tires). (1) Place at least 3 tires without wheels onto the wheel and tire to which the steering pad is tied. The tires may be damaged by the airbag deployment, so use unneeded tires. 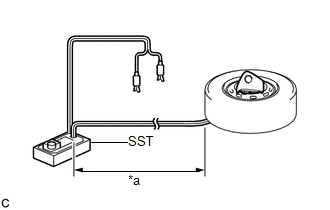 Do not place the SST connector under the tire because it could be damaged. (2) Place a wheel and tire on top. Do not use tires with wheels except for on the top and bottom. (3) Tie the tires together with the 2 wires. Make sure that the wires are tight. Looseness in the wires results in the tires breaking loose when the airbag is deployed. 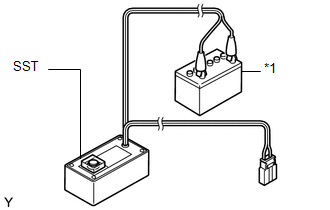 (1) Connect the red clip of SST to the positive (+) battery terminal and the black clip of SST to the negative (-) battery terminal. (2) Check that no one is within a 10 m (32.8 ft.) radius of the wheel to which the steering pad is tied. 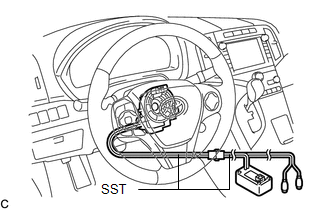 (3) Press the SST activation switch to deploy the airbag. Before deployment, make sure that no one is near the airbag. (h) Dispose of the steering pad. (1) Remove the steering pad from the wheel. (2) Place the steering pad in a plastic bag, tie it tightly and dispose of it according to local regulations.